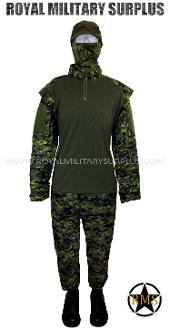 This CADPAT (Temperate Woodland) Tactical Operator Kit includes the Tactical Combat Shirt and Pants in CADPAT (Temperate Woodland Pattern). It also includes a Cadpat (TW - Canadian Digital) Tactical Cap and Balaclava (Adaptive System). All items are brand new and available in all sizes. In use by Canada Army, Military, Police and Special Operation Forces.